What do scientific research methods have to do with the soon-coming destruction of New York City and western civilization? To relate biblical truth to future prophecy, I also use the model of a Russian toy egg. When we open the big wooden egg, we find a smaller egg inside. If we open the smaller egg, an even smaller one appears. Each egg is painted exactly the same being different only in scale. Understanding truth also comes incrementally. To understand the smaller eggs, we must spend some time studying the big egg. The first part of this book deals with God's plan for the universe and His purpose for people as revealed in the Bible. In these chapters, I highlight passages of Scripture that explain important concepts such as why we are here on this planet, where we go after death, and what life will be like when we get to the other side. We must understand our world from God's perspective before we can attempt to understand why there will be an Apocalypse. These biblical insights offer hope for humanity, which is now embroiled in world conflict. 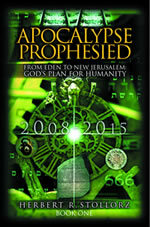 My second book focuses on the events of the seven-year Apocalypse as prophesied in Scripture. Humanity lives in "this world in this time," but God is going to introduce something into the world that will come from "the other side" (Heaven). Our present civilization will end with the Apocalypse. The second book mixes verses from the inspired Word of God with my other discoveries. These discoveries are compared to Scripture to determine if they are congruent, like the big Russian egg matches the smaller ones inside. In my research, I discovered four timetables that contain overlaying patterns of time: historical or prophetic ages, periods, events and dates that interconnect. Using these four tables, I came up with two timelines. Each one reveals the history of humanity. One timeline is viewed from God's perspective in Heaven; the other is from our mortal point of view on earth. Since I am a clockmaker, I decided to display these timelines in the diagram of a clock. To show how the two viewpoints—God's from Heaven and man's from earth—coincide, I constructed a clock that measures the totality of time across the ages of history and prophecy. The World Cuckoo Clock deals with two players on the world stage: Satan and Humanity. Their interaction is indicated by two different dials on the clock face and by two pointers. The short (or hour) hand is Satan’s and the longer one marks time from the human perspective. The World Cuckoo Clock is explained in detail in Chapter 10. I introduce the analogy here in order to give you an overview of the book. Then I come back to it at the end in order to bring it all together again. The clock face shows five large numbers between the two circles or dials. Each number signifies a particular cycle of time as viewed from the perspective of eternity. We live in the time dimension, but at some point, time will end and the universe will go back to eternity. All of human history takes place during the present dimension of time. As we will discover, the primary purpose of the Apocalypse is not the destruction of this world. Instead, it transitions the culmination of our present evil age into God’s new age of peace, love, and righteousness according to His purposed plan. The Apocalypse will be violent because of the almost universal opposition of our present civilization to God’s desired blessings for each person at the establishment of His kingdom over the nations. This irrational rejection of God’s reign is due to Satan’s deceptive lies that bind humanity with chains of fear and death. This fallen angel has enslaved the world to himself so that He may totally destroy our planet and all of its inhabitants. He is the real Enemy of the earth’s family of peoples and cultures, not one another. While preparing the World Cuckoo Clock, I discovered an amazing concept that exposed a new way of interpreting Daniel's prophecies for the end times. I called this concept my "Rosetta Stone," which is developed in detail in part two of this book. Briefly, this "Rosetta Stone" discovery is based on overlaying Daniel's prophecy with the Hebrew Alphabet Number System. The Hebrew Alphabet Number System can help us understand prophecy and interpret the historical cycles of humankind. The Bible is full of numbers. But numbers in Scripture do not just convey mathematical entities; they also disclose deeper meanings and impart hidden concepts. On one level they are simply common letters that make up words, which can be used to create sentences. In addition each letter has a special meaning assigned to it. The third dimension attaches a mathematical value to each letter. No other written language has this pattern. In this book I only want to use the parts of the Hebrew Alphabet Number System that connect to the dating of the Apocalypse. It is not within the scope of this book to explain all of it. The Hebrew letter Daleth is used to represent the number four (4). It literally translates to mean "door" and conveys the concepts of " creation" or "this world in this time." It describes the physical side of mortal man and the finite material earth – both of which are subject to change. Our world is divided into four components in many ways. Our physical bodies are made up of four basic DNA code units. There are four compass directions (north, south, east and west). We have four seasons in a year (summer, winter, spring and autumn). Humanity has often been classified into four color groups (red, yellow, black and white). Many more examples of fours exist. Forty (40) is a higher level of four (4). It is represented by the letter Mem, which refers to a condition of water (mayim). The hieroglyph sign for water is a wavy line, which developed into our letter m.
The number 40 ("water") is the four ("this world in this time") with an added dimension: purpose. We struggle through this life as if we are swimming in a vast ocean. If we give up the struggle, we will drown, which would mean the end of our life on earth. We can either continue living in "this world in this time" (4) or be taken to "the other side" (5), where there is no more struggle. The Bible says, "It is appointed for men to die once and after this comes judgment." (Hebrews 9:27 NASB). The only hope for us is that someone from "the other side" will hook us (Waw) like a fisherman and reel us in. Fortunately for us, God provided that fisherman: Jesus Christ. It rained forty days at the start of Noah's flood. The people of Israel wandered in the desert for forty years. The Israelites congregated for forty days on Mount Sinai. Jesus went into the desert for forty days to be tempted by the devil. All of these experiences represent struggles in this world that had a purpose for the other side. The fifth letter of the Hebrew alphabet is Heh, meaning "window," "eternity" or "the other side." This letter connotes Heaven or the spiritual-immortal side of man. At other times it may point to the Promised Land, the afterlife or eternity. It may also refer to the created beings not living on earth—including the righteous angels like Michael and Gabriel as well as the “fallen” or rebellious angels (demons) like Lucifer (renamed Satan) and Legion. There are multitudes of spirit beings whose names are unknown to us. Many passages in the Bible describe events that have occurred or will occur on earth or in Heaven. Some verses relate the experiences of people who were transferred into Heaven and told to write down what they saw. Most deal with a future time and are connected to the Apocalypse. These passages are difficult for us to fully comprehend because we have never been to "the other side." There is a unique relationship between the numbers four (4) and five (5) in the Hebrew Alphabet Number System. Because human beings live on the "four" level ("this world in this time") but are connected with the "five" level ("the other side"), we are able to make decisions that will affect both our limited lives on earth and our eternal lives in Heaven. For example, the early church fathers were asked to incorporate into the Bible a book written by Thomas, the twin brother of Matthew. The council needed to decide whether to include this book as a "fifth gospel." According to the Hebrew numbering system, a fifth gospel would not fit unless its contents were related to "the other side." The old bishops, understanding the Hebrew Alphabet Number System, decided to allow only four gospels to be canonized. The sixth letter of the Hebrew alphabet is Waw, which means "hook," "connect" or "link." It implies a connection between one thing and another. Used as a prefix, Waw becomes the conjunction “and” that connects one idea in a sentence with another. The six (Waw = 6) days of Creation connect with the seventh day, which came into existence by grace after God finished the creation of earth and man. The Hebrew culture measures days from sunset to sunset: about 6:00 p.m. to 6:00 p.m. Similarly, my second chapter starts with the "sixth world age." Around the world hundreds of different cultures exist, and each has their own story to tell about what they believe and where they came from. In India alone millions of deities are worshiped, many clamor for the number-one spot in the divine hierarchy. The Bible states plainly that there is only one God who created the universe and the earth. All other "gods" are false and belong to Satan's domain because they rebelled with him becoming his cohorts of evil and destruction. If we examine the false religions of the world and consider how they affect these heathen societies, we will quickly realize that an evil force is at work. Poverty, corruption in high places, murder and sacrificial killing, even of children, is on the daily agenda of these pagan cultures. Religious terrorism stretches around the world, killing thousands of innocent victims in the name of revenge. The footprint of Satan, a murderer and liar from the beginning, is not difficult to discern. The God of the Bible is the only one who is love and who gives eternal life, free of charge, to whosoever asks. In Chapter 2 we will look at the purpose for mankind and discover why we are embroiled in the battle of good and evil. The Bible indicates that in eternity past, before the time dimension began, certain created beings existed. In Chapter 2 we will also look at the beings that live on the other side and how they became involved with humans. Future world events only make sense when we compare them with God's purpose and His overall plan for the universe and all peoples. The seventh letter of the Hebrew alphabet is Zayin, which means "sword,” “strife” or “completeness/perfection." Chapter 3 studies the seventh age of the universe. It started with the beginning of mankind (about 4068 BC) and will last about 6,000 years (until AD 2018). This chapter tells how and why mankind shares the time dimension with Satan. Each person's eternal destiny is dependent on the decisions he or she makes in the time dimension. The eighth letter of the Hebrew alphabet is Cheth, which has two possible interpretations as determined by context. The meaning of one is “fenced in" or "surrounded" and the other is “new beginning.” Usually the “fenced in” position relates to earth and the “new beginning” would indicate Heaven (“the other side”). In Chapter 7 we will describe Cheth’s contribution to our understanding. It only covers a very short time period: the seven year Apocalypse (AD 2008 to 2015). The Apocalypse is an integral part of God's overall plan. In order to understand when and how the Apocalypse will take place, His overall plan must be understood. My second book, Mystery of Tammuz 17, explains how the Hebrew Alphabet Number System can be used to predict the timing of the Apocalypse. Based on my study of scriptural prophecy, I believe Heaven will experience an Apocalypse at the same time earth does. The Great War in Heaven will have a powerful impact on the universe, particularly on our planet. This short prophetic age is the focal point of God's purpose. The Apocalypse in Heaven and the Apocalypse on earth will result in a new universe, which will replace the heaven and earth we know today. Incredibly, mankind is invited to participate in this amazing event. The ninth letter of the Hebrew alphabet is Teth, which means "new life." Chapter 9 covers another long age, which will last about 1,000 years. It is the implementation of the hope promised to all who believe. In this book I focus on inspired biblical prophecy. The Scriptures proclaim that there will be a resurrection of man from the dead. Faith in an afterlife has been ingrained in the human race for thousands of years. The resurrection concept is seen in many cultures. Ancient Egyptian tombs and pyramids built 5,000 years ago indicate a belief in an afterlife. But only the Bible can provide the answers to our questions about what happens after we die. According to the Scriptures, at the end of the time dimension there will be two groups of people: those who receive eternal life and those who will end up in the lake of fire. The tenth letter of the Hebrew alphabet is Jod, which means "hand," "higher level of activity" or "law/responsibility." This book introduces the biblical references to God’s New World Order, while my second book delves with great detail into the seven year long Apocalypse that transitions this evil age into the godly one to come. It includes twelve proofs that my theory on the timing of the Apocalypse is accurate. It explains God's plan for the universe and humanity as revealed in the Bible. It also shows how various calendars culminate at a common point that overlays perfectly with Scripture. When I discovered the Hebrew Alphabet Number System, I noticed an interesting relationship between the original Christian and Hebrew faiths. The Bible is rooted in ancient Hebrew writings and the Torah. The Word of God was later completed or fulfilled in the manifestation of Jesus, whose life on earth was recorded in the gospels. Further revelation from God came through the apostolic church in the other New Testament books. The old and new revelations can be compared to a railroad track with two rails. As a balanced system, every rail is independent of the other, but they function together. They are connected in harmony by railroad ties to make up a firm foundation. We need both rails to understand God's oracles properly. One rail represents the Old Testament with the Jewish traditions and festivals, the other one is the New Testament Revelation or the Christian perspective. For centuries, these two faiths have run parallel to each other. Many people believe they are separate religions, but their true spiritual source is the one Creator. For this reason, their complementary heritages reveal God's purpose for humanity, if they are studied and understood jointly together. When treated separately, the truth discovered is incomplete, and the potential for understanding God’s purposes in prophecy is reduced by the forced reliance on only one of these two necessary witnesses. Jews and Gentiles have been antagonizing and persecuting one another for generations, not realizing that the railroad can only function with both rails working side by side. Now, in our modern world, this time of ignorance must end. Humanity is riding the train of the time dimension. According to God's plan, before we arrive at our final destination our train must pass through a burning tunnel. That tunnel is the seven-year Apocalypse, which was prophesied thousands of years ago. The track is on a downhill slope, and the brakes are failing. But God has provided an emergency provision for our safety that the Bible calls "eternal life." God's promises are firmly established, but we must have faith in the provision He has made. Our faith rests on the integrity of the Grand Designer of the railroad. Going through a burning tunnel requires faith. Believing God's Word will give us the confidence to get to the other side. Our diverse society expresses many different opinions about where the train is going. I invite you to forget for a moment your religious background and upbringing. From the front seat of the train, you can see both rails simultaneously. As you look forward to the horizon, it appears as if the rails merge. This is only an illusion. Regardless of what we believe, eventually we will all reach our final destination. After we have died and have departed from this world, it will no longer matter what divided us. We must trust the Designer of the railroad, who planned this route even before the time dimension began. As you read this book, I invite you to become a fellow diver with me, to find valuable pearls submerged in the ocean of the Bible. When attempting to understand prophecy, we should ask three questions. Does it fit with other Scripture references? To affirm an event, there must be at least two witnesses or corroborating verses for earthly things. things. Five Bible verse witnesses are required for things that happen on "the other side." Does it make sense? The God of the universe is not a God of confusion. Everything He does contains logic and symmetry. Does it overlay with other Scripture references to establish a parallel? God repeats important truths multiple times because He knows our limitations. Analyzing historical events can make future events more understandable. In order to explain the Apocalypse, we must first look at the past, as revealed in God's Word. To assist with this understanding, I developed two tables: the 7,000-Year Table of Human History and the 7-Year Table of the Apocalypse. The tables contain several overlays, areas in which the tables have distinct similarities. However, there are some missing "gears" that had to be added. By comparing both tables with the Hebrew Alphabet Number System, we find the dividing line of the time dimension. To predict the future date of the Apocalypse, I had to deal with ancient calendars, which are quite different from ours. Combining them on equal terms into one concept created a table of human history. This makes it easier to accurately compare the different calendars’ data in order to predict the date of the Apocalypse. The 7,000-Year Table of Human History shows twelve cycles of 490 years, based on the Hebrew system of sevens (490 being 7 x 70) on the right side of the Table from the perspective of the Daleth dimension. The left side shows the railroad stations from the Heh dimension perspective. These tables may seem to be a little complex at first, but they will make sense as you work your way through the explanations. I arrived at the beginning date for this table by starting with the year the First Temple was destroyed (588 BC) and counting backward seven (7) cycles of Hebrew years, which brings us to 4018 BC. Converting the cycles of Hebrew years to our solar time, the creation of Adam would have been about 4068 BC. Almost all ancient Near Eastern cultures used annual calendars of 360 days based on twelve lunar months of thirty days each. Some experts believe that the ancient solar year used to match the twelve lunar orbits exactly at 360 days. But that has not been the case for a long time. Many ancient cultures created ways to adjust their lunar calendars to the solar year. The Muslims did not, so their 354-day lunar calendar progressively trails about eleven days in relation to our secular Gregorian calendar of 365.25 days, which is why Muslim festivals seem to fall a little earlier each year. The present Jewish calendar is also lunar with each month starting on a new moon, which was determined in ancient times by visual observation. To adjust today’s lunar cycles to our present 365 day solar year, a second month (Adar II) is added seven times (in the 3rd, 6th, 8th, 11th, 14th, 17th and 19th years) within each nineteen-year time cycle, so that a year of lunar months would properly align and remain synchronized with the seasons of the solar year. A note about these divergent calendars would be in order as it expresses a viewpoint different from what is usually taught in our schools. All three calendars, the Hebrew, Chinese and Aztec, began counting the years from before the Flood. They are more than 5000 years old, and they all use a 360 day year as do the ancient Egyptian and Mesopotamian calendars, too. Our schools commonly teach that prehistoric people were primitive cave or ape men with no knowledge. The image presented is that they were stupid - being below our lowest intelligence, but in our ignorance we fail to ask a few questions. We know today that the earth completes its circuit around the sun in 365.24 days each year. So why is there a difference from the ancient calendars of about 5.24 days? Let’s not assume that these people where not educated enough to notice the five days difference! The fact of the matter is that history reveals that humanity’s first civilization (before the Flood) was more advanced than ours is today as evidenced in mythology and artifacts from around the world. If you could produce for me a mermaid creature – or any half man half animal creature as are so commonly depicted by ancient cultures, then I would believe that we are on par with that first civilization. We are dealing here with physical laws, which have not changed since the beginning of creation, and the only way those creatures could have existed back then was if the first civilization knew more about gene technology than modern science does today. Because natural law works on a basis of “cause and effect,” I believe that there was a scientific reason for an ancient solar year of 360 days. With the Hebrew, Chinese and Aztec calendars we have three independent witnesses from different continents and cultures with totally different languages and histories. Therefore, when they agree on something, we should believe their testimony that there was a 360 day-year cosmic relationship between our earth and the sun in antiquity. To deny such testimony is arrogance of the highest level. The Bible is the only ancient book telling us anything about the civilization from before the Flood. It mentions that aliens (angels) from the outer space came to the earth and reproduced offspring by having children by human women, which were called “nephalim” or giants. These giants were bigger and more violent than normal people inspiring fear and awe. These alien-angels brought a very accurate calendar that positioned the earth and sun as projected from space. The Aztecs copied it and thereby became famous for having the most accurate cosmic calendar – one that even surpasses ours today. Because of this angelic connection, the ancient Aztecs relate their religious teachings and calendar with the serpent from heaven, which descends to the earth at the end of this present age on 21 December 2012. Now back to the law of cause and effect. Today’s annual cycle of 365.24 days/year means that the earth experienced an event that caused it to decelerate in velocity by 5.24 days/year. What caused this change in the calendar? The Bible gives us the answer. It speaks plainly about a worldwide cataclysm that took place in 2288 BC called the Flood. Science indicates that a huge asteroid hit the earth at the same time that the “fountains of the deep broke up.” The impact of this asteroid (the cause) resulted in horrendous effects on earth. I will mention a few of them out of thousands. If our professors were not blinded by their devotion to the theory of evolution, they would recognize most of them. First, the earth’s crust was severely damaged resulting in the shifting of tectonic plates and the separation of the continents. Mountains lifted up and other areas disappeared below sea level. The dinosaurs were not roasted, they died in water and their bones are now found in silt. The atmosphere of high pressured 30% oxygen (Check out the air bubbles found in amber and measure the oxygen content and air pressure.) collapsed, igniting with hydrogen, which was part of an ancient atmosphere before the Flood, to make it rain 40 days. This was the first time that it had rained on earth, and it produced the very first rainbow when the sunlight broke through. Instead of a gentle mist to water the ground, now there was rain and sometimes rainbows. Where as people previously lived hundred of years, now they lived only 75 years, because of the change in the atmosphere that not only reduced the air pressure and oxygen content but also increased the amounts of radiation that reached the ground from the sun. Under the former enriched atmospheric conditions plants grew stems and trunks with big cells, and animals had big cells as their fossil bone structures testify. This profusion of big animals and large tropical plants found all over the world under the old atmospheric canopy was gone. Amber was formed from the residual resin that collected in the big veins of ancient trees twice the size as California’s giant sequoias. Our oil deposits also date to that time. After the Flood atmospheric air pressure at sea level was probably halved , and two thirds of the globe was flash-frozen under thousands of feet of ice, which had condensed at the poles and spread towards the equator. Extremely intense flash freezing is the only explanation for the frozen mammoths found in Polar Regions that still had partially chewed vegetation in their mouths! The resulting temperate zone around the equator birthed the second human civilization in areas now buried in sand. The Bible predicts that another Apocalypse is planned by God, and its agents are already set in motion in the cosmic calendar of coming events . In the near future another asteroid will strike the earth with devastating consequences. This asteroid has been on its way for thousands of years. That is the discovery that I am writing about. This future asteroid is smaller and will not cause a global deluge . God made a covenant with man and said that He would never again judge the world with a total flood of water. This next time His judgment will be with fire, accompanied with burning clusters of heavy space debris this time around. This gives us hope that some will survive the coming catastrophe of the Apocalypse - mostly because God said so. My second book, Mystery of Tammuz 17, describes these natural occurrences as foreseen in the Bible verses written by people who lived 2,000 – 3,000 years ago. The Mini-Apocalypse is when evil intensifies and the big hammer of God’s wrath strikes to destroy it. Most of the prophecies about the Great Tribulation are concentrated in this last part of the seven-year Great Apocalypse. In my second book, The Mystery of Tammuz 17, I explain these events within their biblical context in some detail. In this first book I simply want you to become aware of its existence. The Apocalypse begins with the nuclear destruction of New York City (called "the city of Babylon" in Revelation). Following the destruction of the political power base in the Middle East, the Antichrist comes to power in Europe. A seven-year peace treaty is worked out between Israel and the Palestinians. In the middle of the seven year Apocalypse, the president of the European Union (the Antichrist) is assassinated. The butchering of Jewish settlements causes NATO forces to occupy Israel, breaking the peace agreement with the Palestinians. The Apocalypse ends five months after the destruction of the Third Temple. Jesus Christ returns to establish God’s New World Order on earth beginning in Jerusalem with a redeemed nation of Israel. Many people are now convinced that the world is ending. The problems on earth are out of control and cannot be corrected. The cuckoo clock bird is about to announce its presence. Friedrich Weinreb, Die Symbolik der Bibelsprache (Origo-Verlag, Zurich Schweiz, Swedenborg Verlag Zurich, 1969).